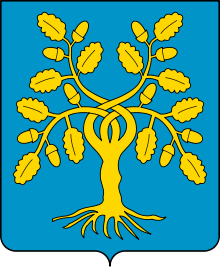 Old coat of arms of Della Rovere. The Della Rovere family (literally "of the Oak Tree") is a noble family of Italy. Coming from modest beginnings in Savona, Liguria, the family rose to prominence through nepotism and ambitious marriages arranged by two della Rovere popes, Francesco della Rovere, who ruled as Pope Sixtus IV (1471–1484) and his nephew Giuliano (Pope Julius II, 1503–1513). Pope Sixtus IV built the Sistine Chapel, which is named for him. The Basilica San Pietro in Vincoli in Rome is the family church of the della Rovere. Guidobaldo da Montefeltro adopted Francesco Maria I della Rovere, his sister's child and nephew of Pope Julius II. Guidobaldo I, who was heirless, called Francesco Maria at his court, and named him as heir of the Duchy of Urbino in 1504, this through the intercession of Julius II. In 1508, Francesco Maria inherited the duchy thereby starting the line of Rovere Dukes of Urbino. That dynasty ended in 1626 when Pope Urban VIII incorporated Urbino into the papal dominions. As compensation to the last sovereign duke, the title only could be continued by Francesco Maria II, and after his death by his heir, Federico Ubaldo. Vittoria, last descendant of the della Rovere family (she was the only child of Federico Ubaldo), married Ferdinando II de' Medici, Grand Duke of Tuscany. They had two children: Cosimo III, Tuscany's longest reigning monarch, and Francesco Maria de' Medici, a prince of the Church. Currently, only a cadet branch of the Lanti Della Rovere is survived, continuing the family traditions. Dotted lines indicate duplicates (where a person appears more than once in the tree). Small caps text indicates the surname of the children (regardless of number) of a union. All persons have the surname Della Rovere unless otherwise indicated. Marek, Miroslav. "Genealogy of Leonardo della Rovere". Genealogy.EU.